New York City and its surrounding areas are flush with Mexican delis with a kitchen installed in the back making mostly antojitos and some full plates. In some neighborhoods they are a dime a dozen, disproving all the "No good Mexican in NYC" crowd on a daily basis. On a recent walk through Bath Beach, I noticed this small Guatemalan deli and decided to walk inside if only because of the relative lack of Guatemalan presence in city. The awning and signage in the window gave no indication of prepared foods within, but when the door is opened you can smell the warmth of home cooking hidden in the back. Unfortunately I came on that day with a stomach that was already full, but wandered to the back to speak with the cooks and ask about the place. Their small steam table does not accomodate much, but they rotate a main dish each day. 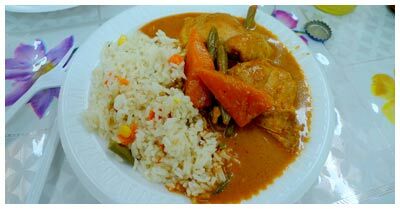 On Fridays they serve pepian ($5.50, below), a chicken dish served in a recado sauce. Everyone has a different recipe for this sauce, making the dish slightly different no matter where you have it. The version here is very mild has a lot of liquid, making it great for scooping up spoonfuls with the rice. When paying in the front, the only question is "How many plates?" so I figure the same price must apply most days for whatever is on offer. This is a large and very enjoyable amount of food for the price, definitely enough to vanquish even the largest of appetites. We added one chuchito (below) to our order, which is also a chicken dish, and similar to a Mexican tamal. The firm masa exterior gives way to tender chicken and sauce, but remember to be careful eating this as the meat is still on the bone on some pieces. A look into the cooler displays a selection of sodas from Guatemala that are way too sweet for my taste, but always find me buying them anyways. At any rate, it is always fun to try new items, and at $1.50 you are not risking much. The ladies here are sweet and motherly, enough to know you are going to enjoy this meal before you even sit down. It's the kind of stuff that will warm you to the core on a cold day, comfort food Central American style.